Important announcements from members of the fleet. Online join/renew process is working again! The online join/renew is working again - thanks to some help from class volunteers! We apologize for the interruption and appreciate your patience. Let us know at info@fssa.com if you have any further issues. Thanks! Then perhaps you’d like to apply to be the assistant editor for SnW magazine! We are looking for an assistant editor for Scots N Water. The person in this one-year position would work side by side with the current editor to organize and proof the magazine and to learn the details that go into producing this magazine six times per year. The expectation is that, if all parties (including the Board) are agreeable, the assistant editor would take over as editor within one year. It is also helpful if this person travels to at least some regattas, including national ones, as a way to meet sailors and hear about possible stories. If you are interested, please contact the current editor, Deb Aronson. 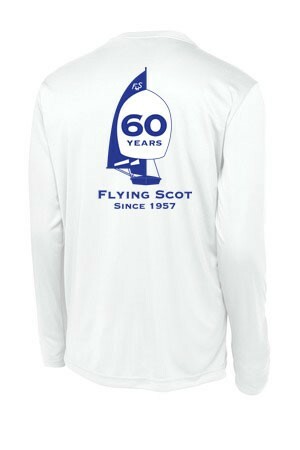 Coral Reef Sailing is now offering 60th Anniversary commemorative apparel! Order your long sleeve or short sleeve tech shirts before April 15th and help promote this special milestone. You can also order custom embroidered shirts, jackets, bags and more by visiting http://www.coralreefsailing.com/index.php/…/flying-scot.html. 60th tech shirts will also be available at the CRS trailer at the Midwinter Championship in New Orleans. Please note on the tech shirts the front chest will show the 60th 'Sail' logo and not the FSSA logo shown on the website at the time of this posting. The tech shirt is a custom screen printing job and these types of jobs are done in large batches. All tech shirts will be shipped after they are printed together in mid to late April. You can also embroider products with either of the three logos shows and those will be processed and shipped individually as the orders come in. The 2016 Flying Scot North American Championships are just a few weeks away, July 16-21, but don;t worry, there's still time to sign up! There's not a much more beautiful place to sail than Newport, Rhode Island and we are fortunate to be holding our regatta there. We'll have a chalk talk sponsored by North Sails every day after racing and we'll have some great dinners together. There are still some rooms avaialble at reasonable prices at hotels within a few minutes of Sail Newport - look under lodging in the NAC page here. To sign up for the Women's NAC or Juniors NAC and/or the NAC go to the event page here to get more information and get the pointers to the Registration Sites on Regatta Network. We need at least 5 Women and 5 Junior entries to hold those events so get your entries in for those events ASAP! We have over 30 boats so far for the NAC and are hoping for lots more! If you sign up before July 10 you save a little money and you help us with planning meals and refreshments. Hope to see your name on the Who's coming list! 2015 Wife Husband Championship 10/24-10/25/2015 - REGISTER NOW! The 2015 Flying Scot Wife Husband Champiobship is quickly Approaching and you'll want to be part of the action! Remember when this event made Sailing World Magazine? It could happen again and you could be there! Bring your spouse to beautiful downtown Tampa, Florida for a sailing honeymoon. The event includes either a five- or three-race series depending on your division, plus a fun range of on-shore festivities. The entry fee is $75 for USSailing members, no late penalty. Campers welcome. Call early for charter and housing options. Find the NOR and other regatta documents, including who's coming, are available HERE. For charters email Mark Taylor. The 2015 Flying Scot Atlantic Coast Championships will be held next week on September 12-13 at Blackbeard Sailing Club, New Bern, NC. Get more information on the event page here. Hope you are lucky enough to be going! Match Racing in a Flying Scot? Why not? the Neenah-Nodaway Yacht Club is sponsoring an 8 boat learn to match race regatta on August 25 and 26. The first 8 boats to register will race, so check out our NOR and registration for at nnyc.org/racing. Click on NOR/Registration and fill out the forms. If we get more than 8 registrants, we will offer places on a waiting list in case of cancellations. August is coming up fast. There is no better place to sail flying scots in August that Lake Winnebago. Please check out our NOR and Registration forms attached. They are also online at nnyc.org/racing. Just click on the NOR/Registration tab. You can register by mail or online. Hope to see you there. Lots of New Content Posted! There's lots of new content that was submitted recently and posted this weekend. Scroll down for all the latest news! Thanks to all for submitting so many articles. It's great to read stories from all over the country! And don't forget to read the most recent Scots n' Water for more great stories about your favorite sailing class and its members!